The 2013 specials of the British science fiction television programme Doctor Who are two additional episodes following the programme's seventh series. In addition to the traditional Christmas episode, a feature of the revived series since 2005, there was also a special celebrating the 50th anniversary of the programme. Both episodes starred Matt Smith as the Eleventh Doctor and Jenna Coleman as Clara Oswald. The 50th anniversary special, "The Day of the Doctor" saw the guest returns of former series leads David Tennant and Billie Piper. The 2013 Christmas special, "The Time of the Doctor", saw the departure of Smith from the series and the introduction of Peter Capaldi as the Twelfth Doctor. "The Day of the Doctor" features the return of the Zygons for the first time since Terror of the Zygons in 1975. "The Time of the Doctor" draws together a number of plot threads that have run through the series since the Eleventh Doctor's first episode in 2010. The Eleventh Doctor and Clara are called in by UNIT to investigate mysterious three-dimensional paintings, including one depicting the Time War of Gallifrey. In the war, the War Doctor, a previously unknown incarnation of the Doctor, plans to use an ancient weapon called "The Moment" to end the ongoing war between Time Lords and Daleks. The Moment, knowing the disasters its use will cause, shows the War Doctor how its use will affect him by uniting him with the Eleventh Doctor, as well as the Tenth Doctor. Together, the three Doctors are able to end a Zygon invasion by enacting peace between Zygons and humans. Though the Doctors still contemplate using the Moment anyway, Clara convinces them to try another way to end the war. Uniting with all their previous and future incarnations, the Doctors use their TARDISes to trap Gallifrey in a pocket universe. In the aftermath, the Tenth and War Doctors return to their own times, with the War Doctor regenerating into the Ninth Doctor, and the Eleventh Doctor is told by the mysterious, but very familiar Curator that it is his mission to find Gallifrey, which the Doctor vows to do. A message echoing through all of time and space emanates from the farming town of Christmas on the planet Trenzalore, where a prophecy states the Doctor will spend the last of his years. With the help of the Papal Mainframe, the Doctor and Clara travel to the village and discover that the message is being sent from Gallifrey by the Time Lords. Sending Clara home, he proceeds to spend hundreds of years fighting and defending Trenzalore against hordes of aliens determined to prevent the Time Lords from returning. Clara returns to find the Daleks are the last remaining aliens, and that the Doctor has fought for so long, with no more regenerations, that he is on the cusp of dying of old age. As the Doctor faces his last stand, Clara convinces the Time Lords to give the Doctor a new regeneration cycle. The Doctor begins to regenerate, destroying the Daleks and ending the war. Clara returns to the TARDIS to find a rejuvenated Doctor about to finish his regeneration. After vowing to remember the incarnation he was and hallucinating a final goodbye to Amy Pond, he finally regenerates into the Twelfth Doctor, as the TARDIS suddenly begins crashing. "The Time of the Doctor" is Matt Smith's last regular appearance as the Eleventh Doctor. In "The Day of the Doctor", Smith and Coleman star alongside David Tennant and Billie Piper; Tennant reprised his role as the Tenth Doctor, while Piper, although credited as playing Rose Tyler, in fact portrays a manifestation of "The Moment", a Gallifreyan super-weapon, that has taken on Rose's form. The casting of Tennant and Piper was announced by the BBC on 30 March 2013. Photographs of Smith, Tennant and Coleman at the first read-through were published, which also confirmed the casting of Gavin & Stacey star Joanna Page. On 8 April 2013, the BBC announced that Jemma Redgrave would reprise her role as Brigadier Lethbridge-Stewart's daughter Kate Stewart from "The Power of Three". Rumours had also circulated that Christopher Eccleston would have some involvement; Eccleston had some discussions with Steven Moffat, but eventually declined to return as the Ninth Doctor. Sylvester McCoy, who played the Seventh Doctor, claimed that none of the surviving actors who portrayed the Doctor prior to Eccleston had been contacted regarding the special. Despite claiming that it would be "a travesty" if his character did not feature in the special, John Barrowman did not feature as Captain Jack Harkness. The release of "The Night of the Doctor" on 14 November revealed that Paul McGann had returned to portray the Eighth Doctor. On 1 June 2013, Matt Smith announced that he would be leaving Doctor Who, with his final episode being the 2013 Christmas Special, with that episode set to feature the Doctor's latest regeneration. Speculation about the identity of the actor set to take over began immediately, with a number of names suggested. The official announcement of the actor of the Twelfth Doctor was made in a special live simulcast on 4 August 2013 in Doctor Who Live: The Next Doctor, and saw confirmation of Peter Capaldi in the role. The 2013 special is the fourth and final Christmas episode to feature Matt Smith's incarnation of the Doctor, and the second to feature Jenna Coleman as Clara Oswald. Showrunner Steven Moffat began writing the script for "The Day of the Doctor" in late 2012, announcing that, as a security precaution, he had not produced any copies, instead keeping it on his computer until it was needed. Moffat has stated that the Christmas episode is intended to tie together the remaining story strands from the Eleventh Doctor era, some of which were introduced as far back as "The Eleventh Hour". 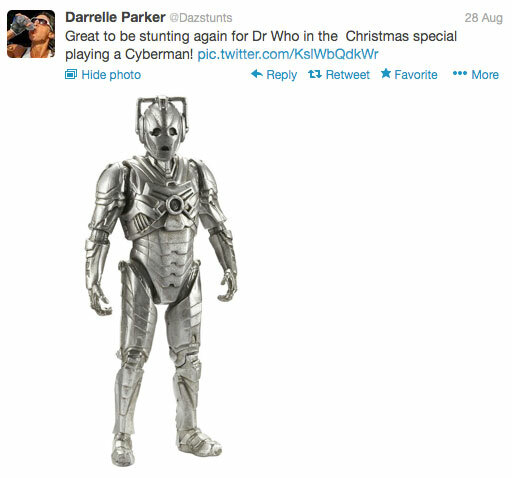 In September 2013, it was revealed that the Cybermen would feature in the Christmas episode, when one of the show's regular stunt artists tweeted that she would be playing a Cyberman. Filming of "The Day of the Doctor" began on 2 April 2013, with David Tennant, Billie Piper, John Hurt and Joanna Page seen at a location outside Neath in South Wales. On 9 April filming took place involving Matt Smith and Jenna-Louise Coleman in Trafalgar Square in London. Various other locations included Chepstow (with some filming done inside the castle), and Cardiff – scenes shot in Cardiff are intended to represent both Totter's Lane and Coal Hill School. Shooting wrapped on 5 May 2013. The final two days of production were taken with shooting the special mini-episode, "The Night of the Doctor", which featured Paul McGann returning to the role of the Eighth Doctor for the first time since 1996. At the 2013 Comic-Con, Matt Smith confirmed that production of the Christmas episode would begin in September, once his work on How to Catch a Monster was complete. Filming for "The Time of the Doctor" began on 8 September. On 10 September, Matt Smith and Jenna Coleman were seen filming on location at Lydstep Flats in Cardiff, which have previously been used in Series 1 and 2 as the Powell Estate where Rose Tyler lived with her mother Jackie. On 19 September 2013, scenes were filmed in the evening at Puzzlewood with fake snow being scattered over certain areas. On 5 October 2013, Doctor Who producer Marcus Wilson revealed via Twitter that filming was complete. In addition to the 50th anniversary episode featuring Matt Smith and David Tennant, a further special was produced to celebrate Doctor Who's half-century. An Adventure in Space and Time, written by Mark Gatiss, was a feature-length docudrama detailing the conception and initial production of Doctor Who. It featured David Bradley as William Hartnell and Reece Shearsmith as Patrick Troughton; Matt Smith has a cameo as himself in his Eleventh Doctor costume. As a complement to "The Day of the Doctor", Peter Davison wrote and directed a 30-minute spoof entitled The Five(ish) Doctors Reboot featuring himself, Colin Baker and Sylvester McCoy attempting to gain parts in the 50th anniversary episode. Produced in mid 2013, the film first became apparent when images of the three staging a "protest" outside BBC Television Centre came out. In addition to Davison, Baker and McCoy, the film featured cameos from a host of people connected with Doctor Who, including Paul McGann, David Tennant, Matt Smith, Steven Moffat, Russell T. Davies and John Barrowman, with David Tennant's wife Georgia Moffet and their children also guest starring. "The Day of the Doctor" formed the centerpiece of the celebrations, which encompassed programmes across all of the BBC's platforms, including An Adventure in Space and Time, a Culture Show special entitled "Me, You and Doctor Who" presented by Matthew Sweet that explores the wider cultural significance of the show. CBBC broadcast a show called "12 Again" in which past and present stars of the show recounted their memories, Professor Brian Cox delivered a televised lecture on the science of Doctor Who, and BBC Three had a weekend devoted to Monsters and Villains, as well as showing "Doctor Who: The Ultimate Guide". The BBC also announced plans to show a newly restored print of the first serial An Unearthly Child. The announcement of the title was also followed by the release of the first official poster for the special. UKTV's Watch showed a story from each doctor to celebrate the 50th anniversary, based around the broadcast of the eleven part BBC America series, The Doctors Revisited. This series has one episode dedicated to each incarnation of the Doctor, and was broadcast monthly alongside an omnibus edition of a serial of each Doctor. Watch is broadcasting two episodes per weekend, starting on 12 October. The British Film Institute ran a year long celebration of the 50th anniversary with monthly screenings of stories from each Doctor, culminating in November with screenings of both "The Day of the Doctor" and An Adventure in Space and Time. BBC Radio 2 broadcast a number of new programmes commemorating the show, including a 90-minute documentary called "Who is the Doctor? "; "The Blagger's Guide to Doctor Who" hosted by David Quantick and Graham Norton's live Saturday show was broadcast from the Doctor Who Celebration event at the ExCel. BBC Radio 1 looked at the phenomenon of "Time Lord Rock", a musical style derived from the music of the show, while BBC Radio 4 Extra broadcast a three-hour special called "Who Made Who", which discussed the world that inspired the show. In October, Big Finish Productions released a 50th anniversary special audio drama featuring the Fourth through Eighth Doctors entitled The Light at the End. "The Day of the Doctor" was released as a standalone DVD and Blu-ray on 2 December 2013 in the United Kingdom, 4 December in Australia, and 10 December in the United States. An Adventure in Space and Time was released on DVD on 2 December in the United Kingdom and 11 December in Australia, and as a DVD/Blu-ray combo in the United States on 27 May 2014. "The Time of the Doctor" was released on DVD and Blu-ray on 20 January 2014 in the United Kingdom, 22 January in Australia and 4 March in the United States. A complete box set was released on 8 September 2014 in the United Kingdom and 10 September in Australia on DVD and Blu-ray. "The Last Day" 1 × 77 min. "An Adventure in Space and Time"
Doctor Who Prom (2013) 1 × 45 min. Specials Doctor Who: The Complete Matt Smith Years 30 × 45 min. Selected pieces of score from "The Day of the Doctor" and "The Time of the Doctor", as composed by Murray Gold, were released on 24 November 2014 by Silva Screen Records. ^ a b c d "Ratings Guide". Doctor Who News. Retrieved 27 December 2014. ^ Lambert, David (15 November 2013). "Doctor Who – More Extras for 'The Day of the Doctor: 50th Anniversary Special' on DVD, Blu #SaveTheDay". TVShowsonDVD.com. Archived from the original on 18 November 2013. Retrieved 16 November 2013. ^ "Doctor Who: David Tennant returns for anniversary show". BBC News. 30 March 2013. Retrieved 30 March 2013. ^ Golder, Dave (2 April 2013). "Doctor Who 50th Anniversary: Another Pic Of Matt Smith And David Tennant". SFX. Retrieved 4 April 2013. ^ Jeffery, Morgan (8 April 2013). "Jemma Redgrave returns for the 50th Anniversary Special". Doctor Who News. Retrieved 8 April 2013. ^ "Reunited: Jemma Redgrave Returns for the Anniversary Special". BBC. 8 April 2013. Retrieved 9 April 2013. ^ Jeffery, Morgan (5 April 2013). "'Doctor Who' 50th: BBC denies Christopher Eccleston 'quitting' rumors – Doctor Who News – Cult". Digital Spy. Retrieved 5 April 2013. ^ "DAVID TENNANT NEWS UPDATES: Sylvester McCoy: No 20th Century Doctors Will Feature In The 50th Anniversary special". Tennantnews.blogspot.co.uk. 4 April 2013. Retrieved 5 April 2013. ^ Masters, Tim (1 June 2013). "Matt Smith to leave Doctor Who at the end of year". BBC News. Retrieved 1 June 2013. ^ Kelly, Stephen (11 July 2013). "Doctor Who's Steven Moffat: the search for the twelfth Doctor is "terrifying"". radiotimes.com. Radio Times. Retrieved 2 August 2013. ^ Kelly, Stephen (1 August 2013). "Doctor Who: The twelfth Doctor to be unveiled in live BBC1 special this Sunday". radiotimes.com. Radio Times. Retrieved 2 August 2013. ^ "Peter Capaldi revealed as Doctor Who's new lead". BBC News. 4 August 2013. Retrieved 4 August 2013. ^ Brown, David (18 March 2013). "Steven Moffat: Doctor Who 50th anniversary script is kept under lock and key". Radio Times. Retrieved 5 April 2013. ^ "Moffat Will Tie Up 11th Doctor Loose Ends". Doctor Who TV. 22 August 2013. Retrieved 30 August 2013. ^ Wace Peck, Matthew (3 September 2013). "Cybermen set for Matt Smith/Peter Capaldi 'Doctor Who' special". Digital Journal. Retrieved 9 September 2013. ^ Leigh, Rob (3 April 2013). "Who's David Tennant talking to? First location pics of Tenth Doctor and Joanna Page filming 50th anniversary special". The Mirror. Retrieved 5 April 2013. ^ Doctor Who 50th special London filming!! (Video). London: Youtube. 2013. Retrieved 9 April 2013. ^ Dex, Robert (9 April 2013). "Matt Smith lands the Tardis lands in Trafalgar Square for Doctor Who 50th anniversary episode. Filming wrapped up on May 6th, 2013. A longer film then usual, suggesting the special might be longer than previously suggested". The Independent. Retrieved 9 April 2013. ^ Fitzmaurice, Sarah (18 April 2013). "How are they going to explain that then? David Tennant and Matt Smith seen on set together as they shoot 50th Anniversary special of Doctor Who". Daily Mail. Retrieved 22 April 2013. ^ Kelly, Stephen (3 May 2013). "Spoilers! Doctor Who 50th anniversary filming pictures suggest nod to first ever episode". RadioTimes. Retrieved 6 May 2013. ^ "Producer Marcus Wilson on Twitter". Cultbox. Retrieved 6 May 2013. ^ "Steven Moffat on The Night Of The Doctor". BBC. 14 November 2013. Retrieved 19 November 2013. ^ "Smith on his "Final Hour", Hurt Revelations, 12th Doctor". Doctor Who TV. 19 July 2013. Retrieved 21 July 2013. ^ "Matt Smith to start shooting Christmas Special from Sunday". Doctor Who News. 4 September 2013. Retrieved 4 September 2013. ^ "Farewell Matt! Christmas Filming Wraps". Doctor Who TV. 6 October 2013. ^ "Classic Doctors Protest over 50th?". Doctor Who TV. 9 September 2013. Retrieved 24 November 2013. ^ Paul Jones (24 November 2013). "Peter Davison, Colin Baker and Sylvester McCoy unite for Doctor Who spoof The Five(ish) Doctors". Radio Times. Retrieved 24 November 2013. ^ Dowell, Brian (10 September 2013). "Doctor Who 50th anniversary shows to feature Professor Brian Cox and restored episodes". Radio Times. Retrieved 10 September 2013. ^ a b "Fifty years of Doctor Who to culminate in The Day of the Doctor". BBC Media Centre. BBC. 10 September 2013. Retrieved 11 September 2013. ^ "The Day of the Doctor: new promotional image and press details released". Doctor Who News. 11 September 2013. Retrieved 11 September 2013. ^ The Doctor Who Team (11 September 2013). "Doctor Who – The Day of the Doctor: 50th Anniversary Update". British Broadcasting Corporation. Retrieved 11 September 2013. ^ Lesnick, Silas (10 September 2013). "The Poster for Doctor Who's 50th Anniversary Special, The Day of the Doctor!". Retrieved 11 September 2013. ^ "The Doctors Revisited reaches the United Kingdom". Doctor Who News. 13 September 2013. Retrieved 16 September 2013. ^ Jones, Paul (25 September 2013). "Classic Doctor Who episodes and air dates confirmed for The Doctors Revisited". Radio Times. Retrieved 27 September 2013. ^ "Doctor Who at 50". BFI Southbank. British Film Institute. Retrieved 31 October 2013. ^ Justin Johnson (11 January 2013). "Doctor Who at 50". BFI Southbank. British Film Institute. Retrieved 31 October 2013. ^ ""Doctor Who" Doctor Who: 50th Anniversary (DVD) at BBC Shop". Bbcshop.com. Retrieved 2013-09-11. ^ "Doctor Who: The Day of the Doctor". EzyDVD. Archived from the original on 16 October 2013. Retrieved 11 October 2013. ^ "Doctor Who - 'The Day of the Doctor: 50th Anniversary Special': Date, Cost, Packaging, More!". TVShowsOnDVD.com. 20 September 2013. Retrieved 2 October 2013. ^ "Doctor Who: The Time of the Doctor & Other Eleventh Doctor Christmas Specials (DVD)". bbcshop.com. 2013-12-20. Retrieved 2013-12-20. ^ "Doctor Who: The Time of the Doctor & Other Eleventh Doctor Christmas Specials (DVD)". ezydvd.com. 20 December 2013. Archived from the original on 20 December 2013. Retrieved 20 December 2013. ^ "Doctor Who - 'The Time of the Doctor: 2013 Christmas Special': Date, Cost, Extras, Art!". TVshowsondvd.com. 18 December 2013. Archived from the original on 19 December 2013. Retrieved 19 December 2013. ^ "Doctor Who: 50th Anniversary Collector's Edition (DVD)". BBC Shop. Retrieved 25 July 2014. ^ "Doctor Who: The 50th Anniversary Collector's Edition". JB Hi-Fi. Retrieved 8 August 2014. ^ "Doctor Who: The Matt Smith Years [Blu-ray]". Amazon.com. Retrieved 21 August 2014. ^ "Dr.Who: The Matt Smith Coll (DVD)". Amazon.com. Retrieved 16 December 2018. ^ "Steven Moffat and Russell T Davies are writing special Doctor Who novels". Radio Times. 15 November 2017. Retrieved 9 December 2017. ^ Moffat, Steven (5 April 2018). "Doctor Who: The Day of the Doctor". BBC Books – via Amazon. ^ a b "Weekly top 30 programmes". Broadcasters' Audience Research Board. ^ "The Day of the Doctor - Overnight Viewing Figures". Doctor Who News. 24 November 2013. Retrieved 25 October 2018. ^ "The Time of the Doctor - Overnight Viewing Figures". Doctor Who News. 26 December 2013. Retrieved 25 October 2018. ^ Silva Screen Music. "Doctor Who – The Day Of The Doctor/ The Time Of The Doctor – Original Television Soundtrack". Amazon.co.uk. Retrieved 2014-10-29. This page was last edited on 15 February 2019, at 15:01 (UTC).